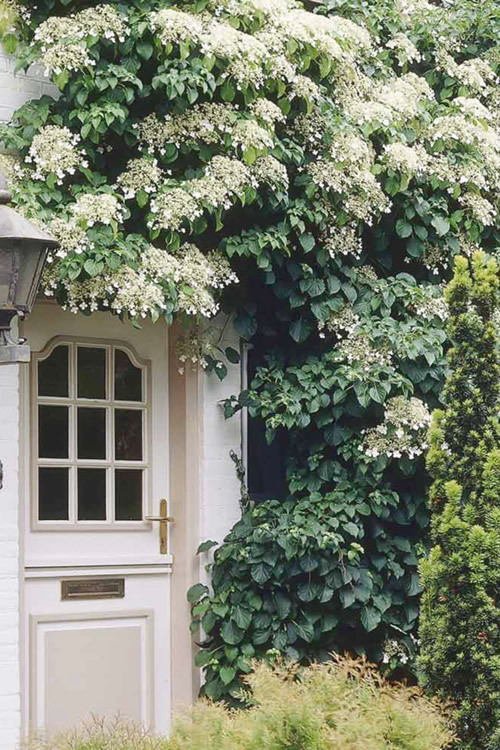 Planting the Climbing Hydrangea Petiolaris is the perfect way to soften and decorate a trellis, tree trunk, or stark brick or stone garden wall. 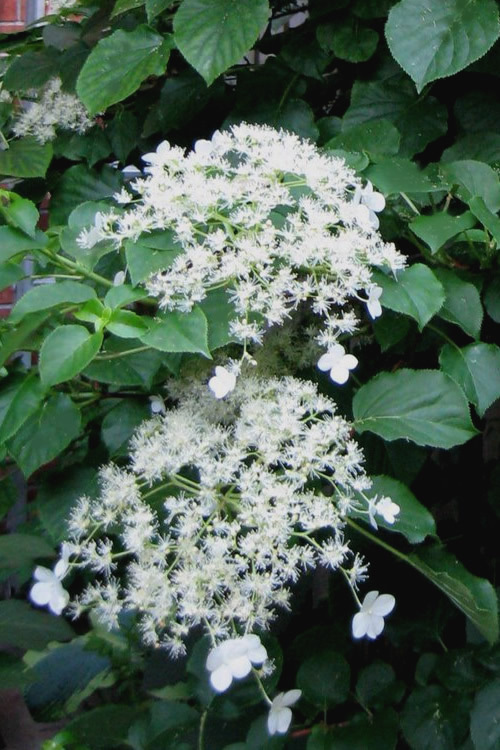 In May and June the vine produces abundant, large, 7 to 8-inch diameter lacecap clusters of fragrant white flowers at the ends of branches that can extend up to 3 feet from the tree trunk or other supporting structure. Get all the details below! 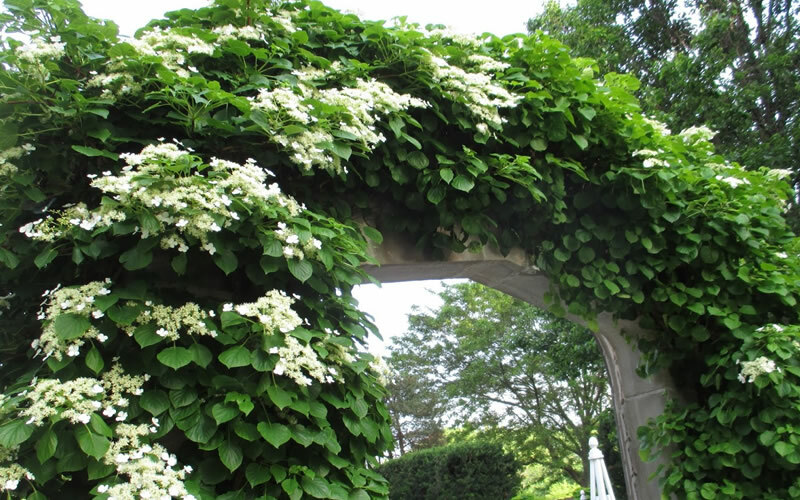 Planting the Climbing Hydrangea Petiolaris is the perfect way to soften and decorate a trellis, tree trunk, or stark brick or stone garden wall. 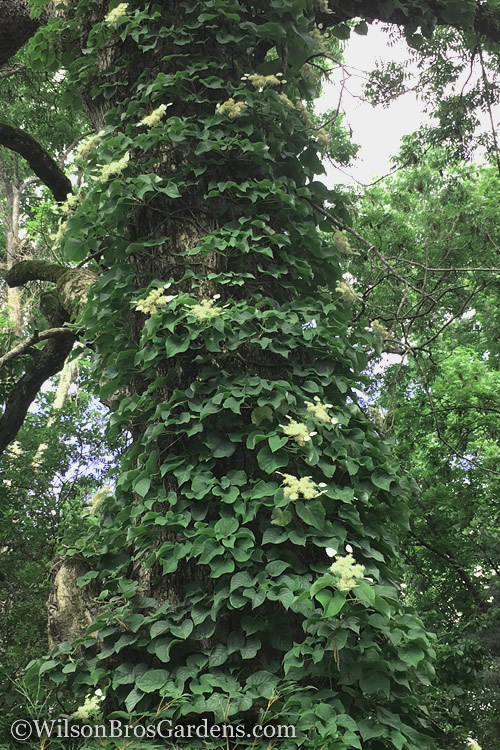 In May and June the vine produces abundant, large, 7 to 8-inch diameter lacecap clusters of fragrant white flowers at the ends of branches that can extend up to 3 feet from the tree trunk or other supporting structure. 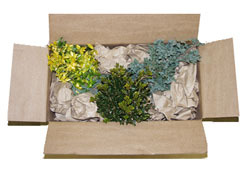 The dried flower clusters and reddish brown peeling bark are attractive in winter. 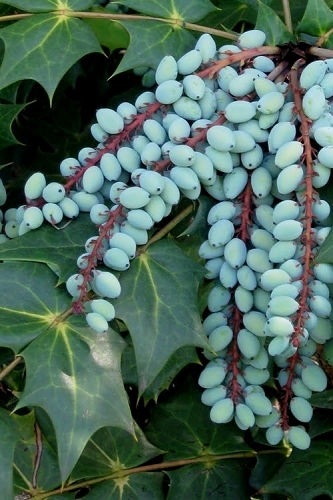 No attachments are necessary for this vine to climb as it naturally clings to bark, wood, brick and other surfaces using its own aerial roots, which won't harm your walls or trees. 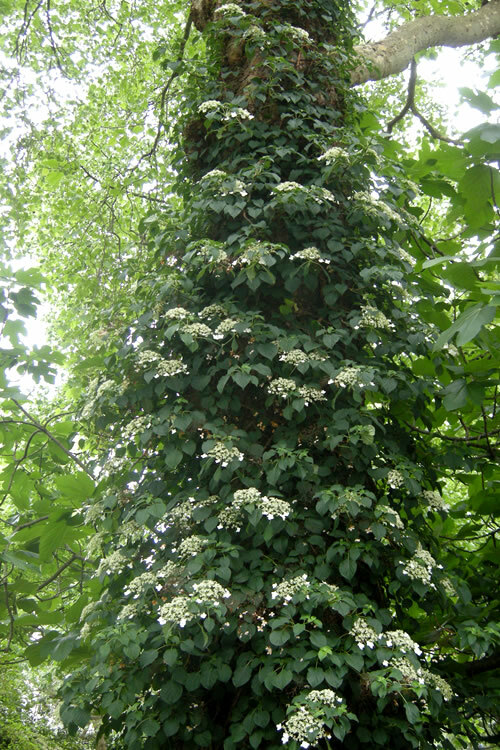 When not in flower the pretty, the heart-shaped leaves of Hydrangea Petiolaris make this climbing vine an highly attractive covering for a large tree trunk, wall or fence. In our gardens, we have one that has climbed over 30 feet high up the trunk of a large 70 year old pecan tree. 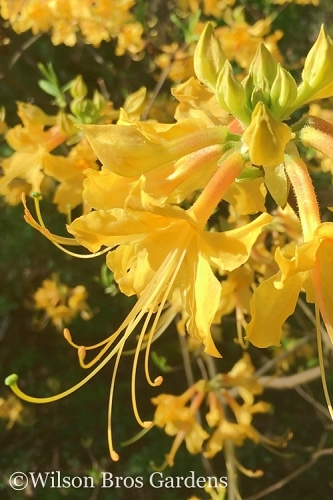 Here in Georgia USDA Zone 8a and further south this one prefers some afternoon shade or filtered sun but will grow in full sun or part shade in USDA Zones 4 through 7. 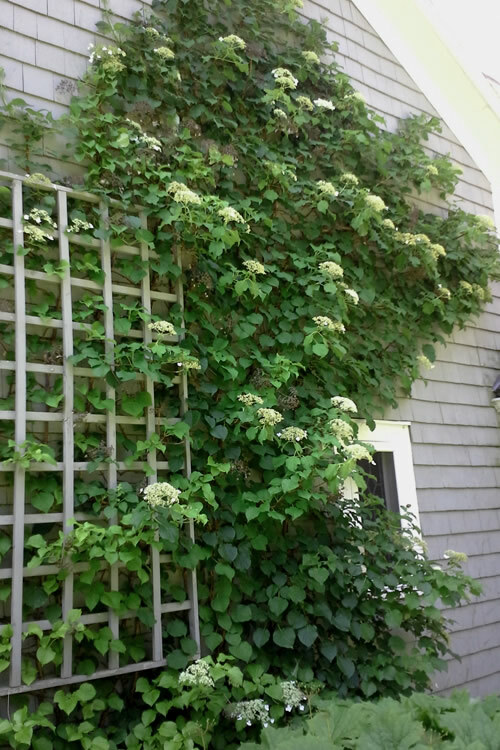 Climbing up to 40 feet or more in height, the Climbing Hydrangea Petiolaris provides wonderful texture and color as a vertical accent on home foundation or other walls, trellises, arbors, pergolas, and tree trunks. 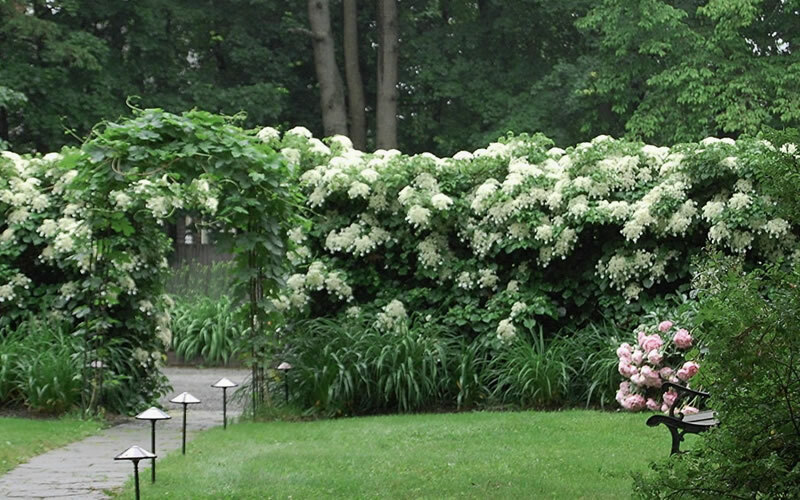 A fine addition to Hydrangea gardens, white gardens, fragrance gardens and cottage gardens. 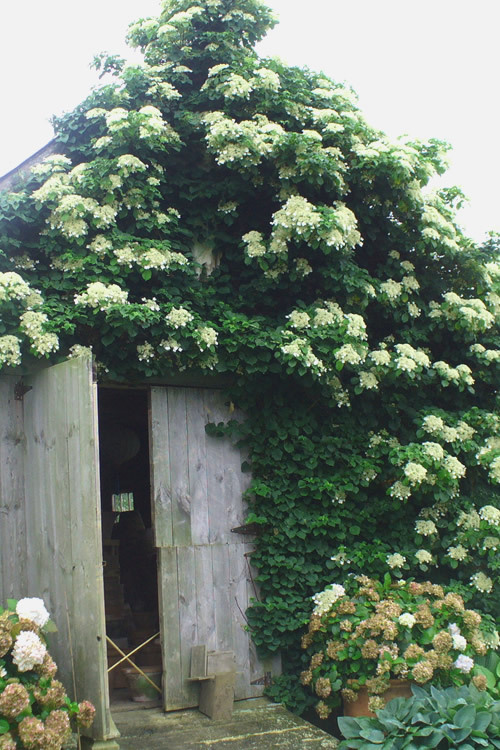 Climbing Hydrangea is easy to grow. 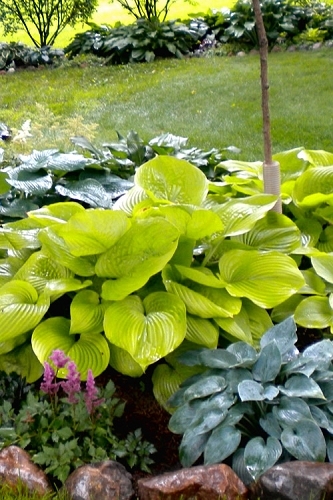 It's not aggressive and the delicate aerial rootlets by which it clings won't harm your walls or your trees. 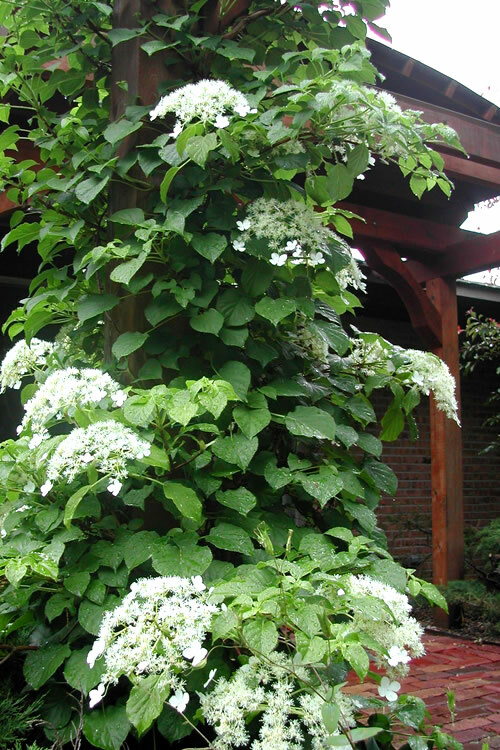 Climbing Hydrangea is also one of a few ornamental vines that will flower even in shade. 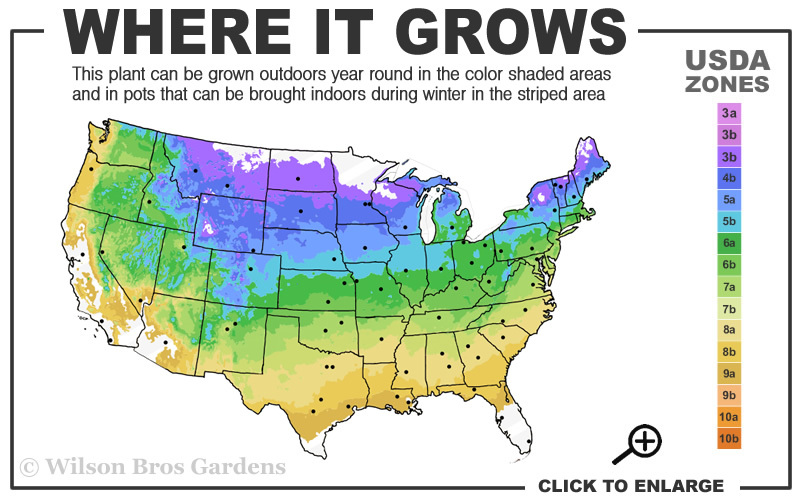 grows in full sun to part shade in USDA Zones 4a to 7b but will appreciate filtered sun or shade in the afternoon in Zones 8a-9b. Grows well in moist but well-drained soils of average fertility. 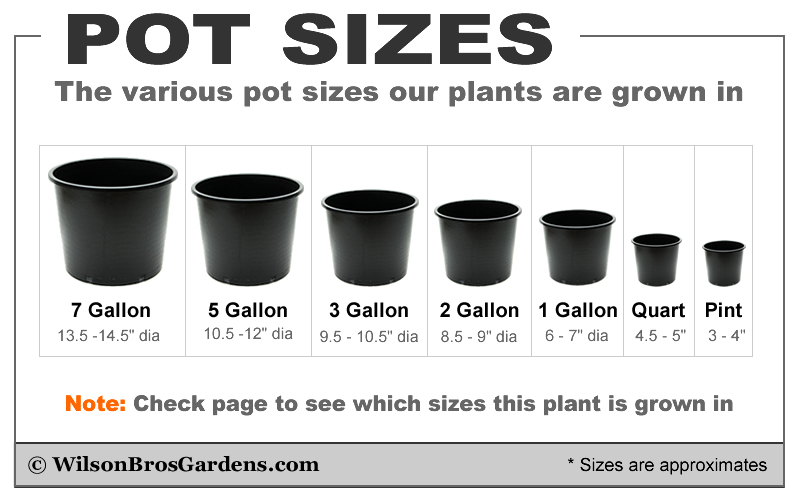 Flower Size: .5" in 8" diameter clusters! 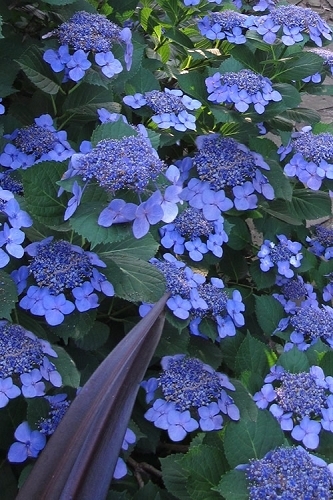 Click on a link below to find helpful advice from our experts on planting & caring for Hydrangeas.